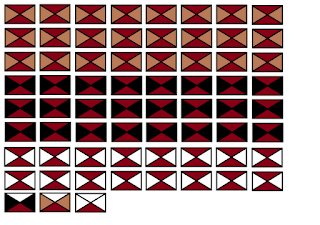 The recent game I fought set during the Zulu War required the use of a new set of blocks for the Zulus themselves. It also reminded me that I needed to give some thought as to how best to represent the various Colonial forces faced by the European powers during the 19th (and 20th) century. I had already decided to use conventional military symbols but was initially stuck with what colours to use. The Zulus were actually quite straightforward to design. Taking the typical infantry unit symbol as a start point I tried to envisage what an actual warrior would look like when converted into triangles. I came up with brown as the top and bottom triangle - a stylised human figure if you like - and then made the two side triangle the predominant colour for the unit shield. My knowledge of the Zulu War is quite basic but believe that Zulu regiments used grading system for shield designs so that the newest, unmarried warriors had the darkest shields whilst the longest serving veterans had white shields. 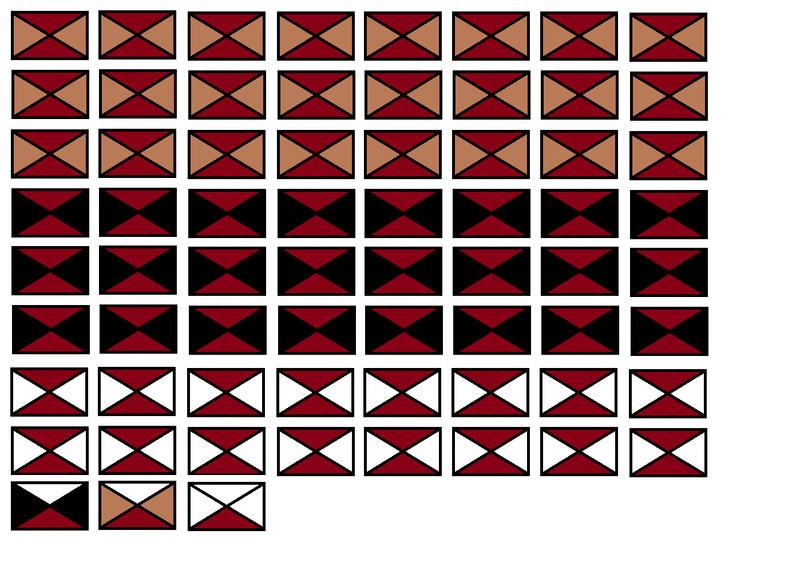 The married regiments in between used shields of a variety of shades with brown featuring predominantly. This was then easy to translate into black fro the unmarried troops, brown for the married and white for the veterans. The command blocks used the same design for the shields but I gave them a white top triangle to symbolise an ornate headdress. Very abstract I know but it looked pretty effective in action. I want to extend this approach to cover what I would call the 'turban wearing' types - Afghans, Mahdists and Arab types. These will feature a white top triangle and varying colours for the two side triangles. I will also need to consider mounted types and am considering using the dark brown 'skin' tone I used for the Zulus as the basis for the labels. The same will apply for native artillery.